Welcome to my office. I’m Holly Drinkwater, an Archaeological Supervisor working for NAA, and I’m currently lucky enough to be presiding over the excavation of an Anglo-Saxon cemetery in the North-East of England. This photo gives you a taste of what greets me when I come to work in the morning; not everyone’s cup of tea I’m sure but dealing with ancient human remains is a common and necessary fact of life as a commercial archaeologist. I’ve fostered a keen interest in the study of human remains from a young age, ever since I was introduced to my first Egyptian mummies at Manchester Museum, so the opportunity to gain physical experience in excavating and recording them in a professional capacity has been especially rewarding. It also has its fair share of challenges. "In an ideal world, human remains would stay in the ground where they are buried. However, the needs of the modern world mean that this is not always possible." The excavation of human remains understandably requires care and sensitivity, as well as a detailed recording process to preserve as much information as possible. These processes are time-consuming and also quite fiddly! Once we have revealed a grave, we will then remove the soil around the occupant(s) using wooden and plastic tools, which don’t cause damage to the bones like metal tools would. 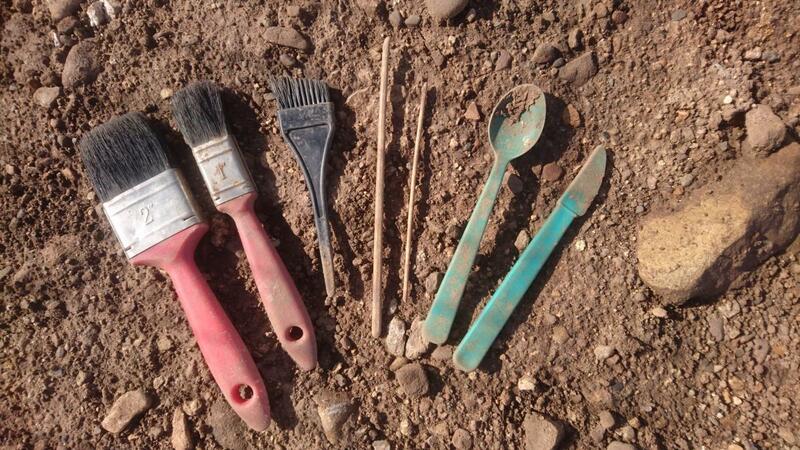 Each archaeologist has their own preferred tool kit for this delicate process, featuring some rather unorthodox items. For example, my personal tools of choice are chopsticks, a hair dye brush and a plastic knife and spoon. When we have fully revealed the extent of remains within the grave, we can begin recording them in situ. In addition to analogue and digital photographs, each burial is recorded via the process of photogrammetry, whereby a 3D model will be created. The black and white tags you can see in the photo are known as ‘photo rectification points’. We place these around the limits of the burial and record their co-ordinates on a site grid in order to locate the images in post-excavation. A series of overlapping digital photos is then taken, moving in a decreasing spiral around the burial to record all of the details. This series of photographs will then be pieced together to create a 3D model of the grave and remains. In addition, burials are also recorded by hand on scale plans and the details of the grave cut, skeletal remains and grave fill are documented on context sheets to form a paper archive. As the photo shows, our cemetery is fairly ‘busy’ and it has been a massive challenge for us to try and unpick the relationships between the burials and the order in which they were deposited. You can see from the photo that later burials have been cut into earlier graves, disturbing the remains of previous occupants and indicating that this particular area of the cemetery was in use over a number of generations. Once recorded, the remains will be lifted and placed in boxes ready to be transported to our office, where they will be carefully washed ready for further analysis by an osteoarchaeologist. In an ideal world, human remains would stay in the ground where they are buried. However, the needs of the modern world mean that this is not always possible. As archaeologists, we are rewarded in the knowledge that we are saving the remains of our ancestors from the impact of development and that the information gained from our work can provide an unrivalled insight into our past.